Can you imagine Martin Luther King Jr’s “I Have a Dream” speech taking place in front of a pyramid? Or what the $5 bill would look like with a ziggurat on the back? The Lincoln Memorial as we know it has been an iconic monument for nearly a century; it was dedicated by Chief Justice William Howard Taft on May 30, 1922. But the memorial committee had a host of other designs to choose from—and the National Mall would have looked much different if one of them had made the cut. Congress approved funding for a structure honoring Lincoln in 1911, and gave the Lincoln Memorial Commission a budget of $2 million—an incredible sum that had never been given for a national memorial before. Many architects were eager to do work at that scale, but it ultimately came down to two: John Russell Pope and Henry Bacon. While Bacon's offerings were largely of the neoclassical variety, Pope submitted a number of sketches inspired by monuments and memorials from other cultures, from classic Greek to ancient Mesopotamia. This Parthenon-inspired structure would have been located at Meridian Hill instead of the National Mall. At 250 feet tall, it would have bested Capitol Hill by about 150 feet. A colossal ziggurat monument, similar to styles from ancient Mesopotamia, Pope's other proposed structure would have featured four statues at the base, with a massive bronze statue of Lincoln standing guard from the top. An pyramid with porticoes on each side, this design from Pope would have reflected the Egyptian-inspired obelisk of the Washington Monument. 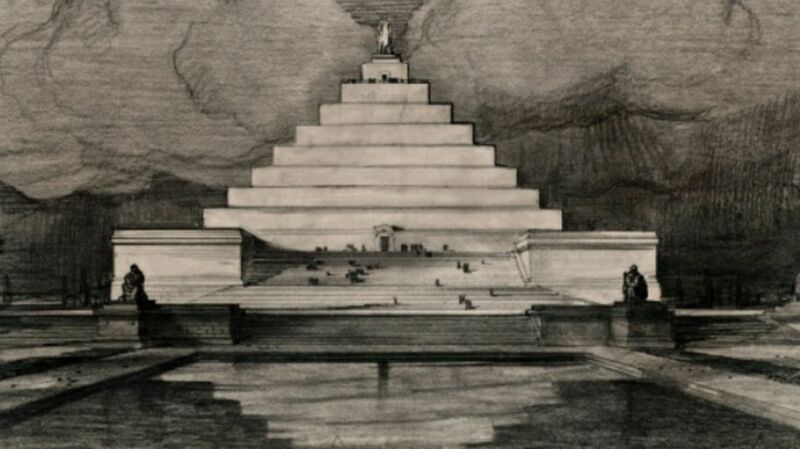 Another pyramid from Pope, this one a Mayan-style tribute, would have included an eternal flame burning at the peak. Though the winning design submitted by Bacon was altered, you can see how elements of this design were used in the final result—a neoclassical temple with a statue of Lincoln and engravings of some of his most famous speeches. Though Pope was no doubt disappointed that one of his designs wasn't chosen for the Lincoln Memorial, he secured his own spot in architectural history when he won the Jefferson Memorial job in 1935.